Wigs in Delhi welcomes you & offers the best wigs all over in Delhi NCR. 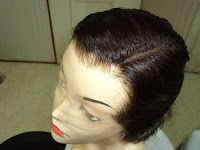 If you are looking for a natural human hair wig, then you are on the right way to avail 100% genuine wig made from human hairs at Wigs in Delhi. This type of wig is suitable for anyone to wear. In India, there are many peoples, who face the problem of Hair Loss & it is increasing day by day and are always in search how to cover their baldness area with full of hair or hair loss solution. Wig is the solution to cover-up the scalp area without any non surgical procedure. There are various types of wigs like long wigs, lace wigs, curly wigs and many more, are available at our Wig Store in Delhi. Wigs are available with us at best rates. Wig in Delhi provides you the solution for baldness, with care to your hairs. Now its a time to say goodbye to your baldness and no need to think about the solution of baldness when you look yourself in the mirror. Its a time to wear a wig and give yourself an attractive look. We provide all kinds of wigs for men & women both in Dellhi, NCR, Noida. Wigs in Delhi will change your look and confidence. Wigs can cover up natural hair problems. No dedication. You can try different designs. You never have a bad Hair day. Wigs can secure your Hairs. You can preserve a lot of money!